Submitted by Jeff Buster on Wed, 11/11/2009 - 19:11. Submitted by lmcshane on Sat, 11/14/2009 - 08:47. Can be beautiful :) What type of gourd?? Submitted by Jeff Buster on Thu, 11/12/2009 - 11:52. From end to end this gourd is about 12 inches long. Fascinating that the DNA controls both the bizarre geometry – with the wart-like surface – and the distribution of color both longitudinally and radially. 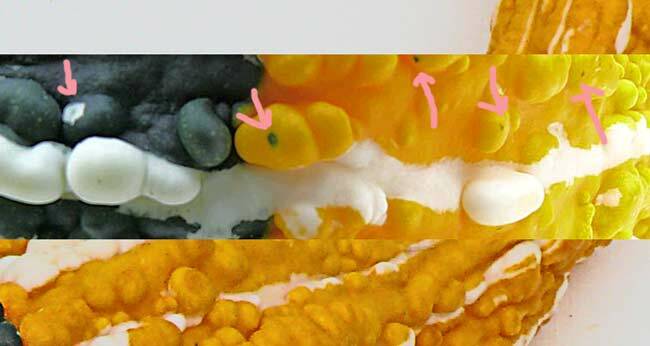 Mold also has some spectacular colors - especially on bread - but this isn't mold on the gourd. Anyone know the name of this type of gourd? Submitted by jerleen1 on Thu, 11/12/2009 - 22:50. The shape and warts indicate to me that it is a soft skin gourd. Submitted by westward on Thu, 11/12/2009 - 22:57. The reflection from my sunglasses is so severe that it is hard to make out the gourd. Maybe it is a Scott's process gourd, maybe not. All kidding side, Jeff is an amazing photographer. The colors, the angles, and texture is so rich. Submitted by Jeff Buster on Thu, 11/12/2009 - 23:41. Submitted by westward on Fri, 11/13/2009 - 00:10. Hey, thank you for the photos and the spins that you put on them that makes us curious. Thanks for the answers you just gave about the glasses and the scott's miracle grow. Like you said, the power of google, just don't know enough about "lawn care" to find it unless given clues. Grass is just green background noise that has to be kept at a low volume to appease the neighbors. Submitted by westward on Thu, 11/12/2009 - 22:59. If it were dried and carved? Submitted by skd0333 on Thu, 11/12/2009 - 22:09. Jeff, this is a superb header. I am blown away. Gorgeous!!!!!!!! Submitted by ward14resident on Thu, 11/12/2009 - 23:16. I had no idea that was a gourd until lmcshane asked what type of gourd. If I had to name the gourd I would name it a gooseneck gourd because it looks like a gooseneck to me. I agree that Jeff's photos capture the colors, texture, angles, the very essense of the subject. Submitted by Jeff Buster on Fri, 11/13/2009 - 00:10. The camera is only one component of the final web image. Being able to review each of the raw digital images on the computer, think about each of those images, compare them, and then work on several of them in Photoshop - This is another critical component of the final image. Many, many times the image that is captured by the camera has data and details that I never recognized or intended to capture. As examined in the movie Blow Up, the digital (then film) camera sees more than you can. So it wasn't until after the header was up that I saw the pattern of green dots (and one white dot with green in its center) which I have drawn arrows to point out in the image below. These green dots are not errant or maverick. They are there because of DNA code. So wouldn't it be cool to be able to view the DNA and observe the color code in the DNA helix just as the digital camera observes the color in the actual gourd? Where is the consumer camera tool for that observation! I want one! Submitted by ward14resident on Fri, 11/13/2009 - 00:44. Thanks Jeff. Lots of work obviously goes into the pics you post. I feel so fortunate to have found this site. It adds something to my life. Submitted by jerleen1 on Fri, 11/13/2009 - 09:27. There are hard skin and soft skin gourds. Soft skin gourds grow in really wierd shapes, and in multi colors of oranges, yellows, greens, blues and they have all those warts. They also bloom during the day. Hard skin gourds are the greenish white gourds that are kind of smooth and the vines bloom in the evening or at night. Lots of people in the hills grow gourds. They usually plant them along the fences for everybody to admire because no matter how many seeds you plant you never get two of identical ones. Submitted by None on Fri, 11/13/2009 - 09:05. Oh it’s a gourd, I was wondering what it was…. Jeff have you been on Quincy and Woodland lately, I made the trek the other day. Buildings are missing, it made me wonder if they are clearing the foundations, it seems to happen so fast. Submitted by Jeff Buster on Fri, 11/13/2009 - 22:04. Yes, Oengus, a defunct factory was just demolished on Quincy at Woodhill. I have taken photos of that falling down structure for a few years. It is now piles of rubble. And on Woodland at Buckeye the building with the curtains flying out the windows was removed. I felt bad about that one. Submitted by lmcshane on Fri, 11/13/2009 - 09:59. Oengus--disappearances are happening at a fast and furious pace. You will see a building one day and it will be gone the next day. This is the plan. USE the taxpayers' money to clear land for future development. These developers will pick up the land at rock bottom prices. It gets ugly when they also have to clear living people in the process. It helps if they are dead, first. Look harder. Submitted by lmcshane on Fri, 11/13/2009 - 09:43. The gourds that Native Americans used for millennia as containers did not originate in Africa and float across the Atlantic, say experts led by Bruce Smith of the National Museum of American History New analyses of ancient gourd fragments in the Americas suggest people carried the plant from Asia about 10,000 years ago. Thus bottle gourds are one of the oldest domesticated species. Submitted by jerleen1 on Fri, 11/13/2009 - 12:06. All I know is that I grew up being taught that gourds were grown for utilitarian purposes as well as decorative and craft uses. The soft skin gourds were often put to luminiary uses. Everybody had "smoke houses" and they would hang the gourds all over the walls and from the ceiling of the smoke houses to dry during the winter. When we were kids we would play by pecking out a beat on them and depending on the stage of the drying process, they would make different sounds - we called ourselves playing music. If somebody was feeling generous, they'd make us a horne out of a small bottle necked one and we'd pretend to toot. Submitted by lmcshane on Sat, 11/14/2009 - 09:11.
an ornamental gourd. Is it good for eating? Taken to an extreme--do plants use US? Submitted by None on Sat, 11/14/2009 - 10:09. 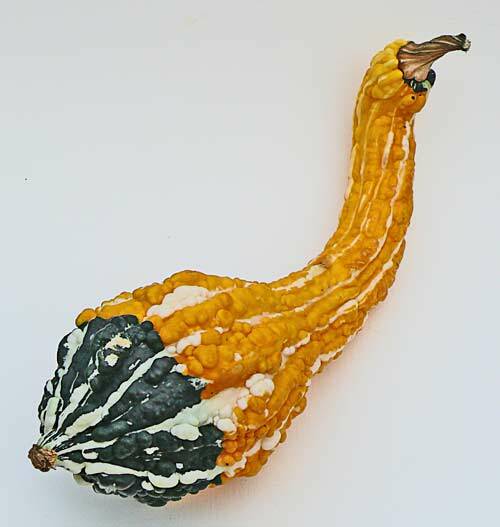 That’s an ornamental gourd Cucurbita pepo, there are a lot of varieties, that’s a warty/goose neck? They can cross pollinate with other varieties in the same family like pumpkins and summer squash, adding more varieties. Farmers usually grow either edible or inedible gourds because the fruits flavor can be affected by these gourds. It's a species within a family called Cucurbitaceae of which there are hundreds and with those at least one hundred genera. Explains the little striped gourds that look like pumpkins, they are part pumpkin. What type is it; call it a curbity, that one is striped, warty and has a goose neck.